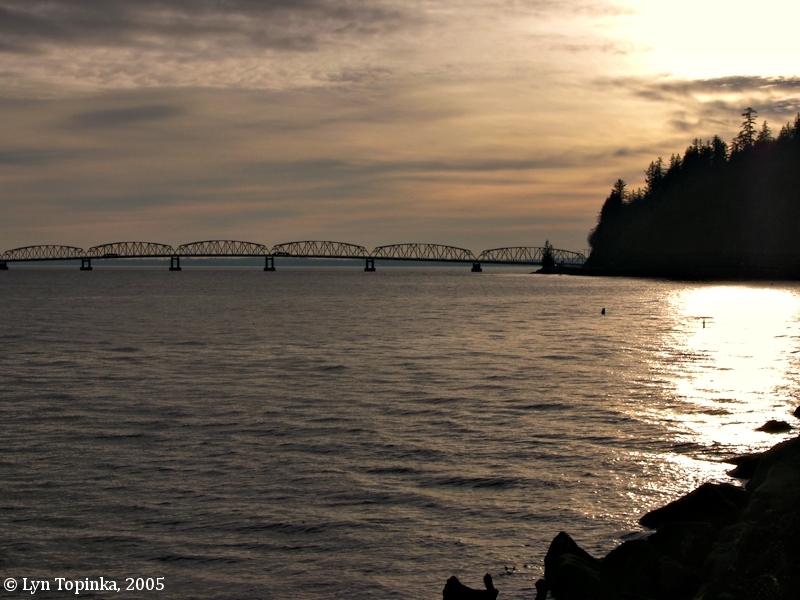 Click image to enlarge Point Ellice, Washington. View from Megler Rest Area off of Washington Highway 401. Image taken November 9, 2005. Point Ellice is located on the Washington side of the Columbia River at approximately River Mile (RM) 14, and is the Washington State end of the Astoria-Megler Bridge. 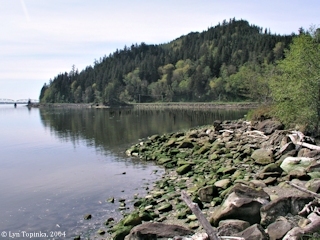 Upstream of Point Ellice is Megler, the location of Lewis and Clark's "dismal nitch" campsite. Downstream is McGowan, the location of Lewis and Clark's "Station Camp" campsite, where the men spent 10 days in November 1805. 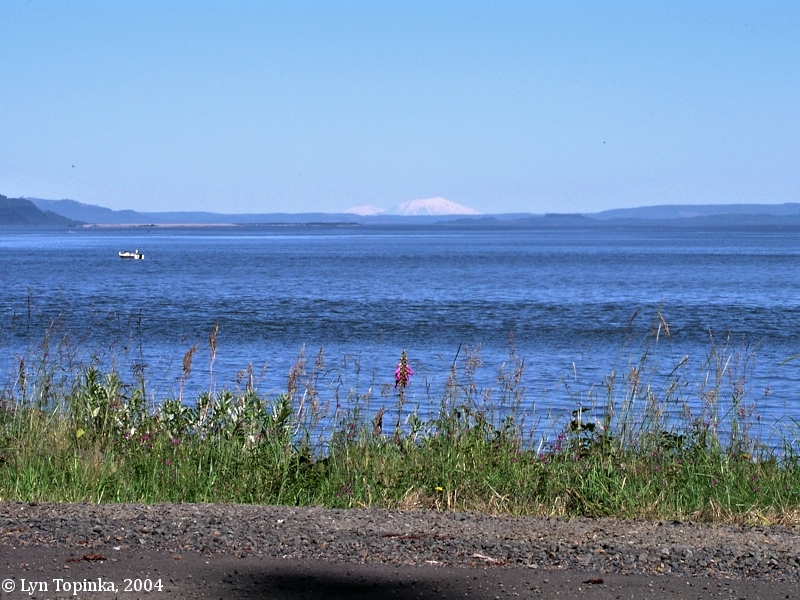 In 1805 because of bad weather, Lewis and Clark were forced to camp for 5 days on the east side of Point Ellice in the Megler area, before being able to round the point and set up camp on a sandy beach which they would name Station Camp. The men called Point Ellice "Point Distress", "Stormy Point", and "Blustering Point". Point Ellice was named by fur traders of the North West Company to honor Edward Ellice, a London agent of the company, who, in 1821, was instrumental in combining the North West Company with the Hudson's Bay Company. 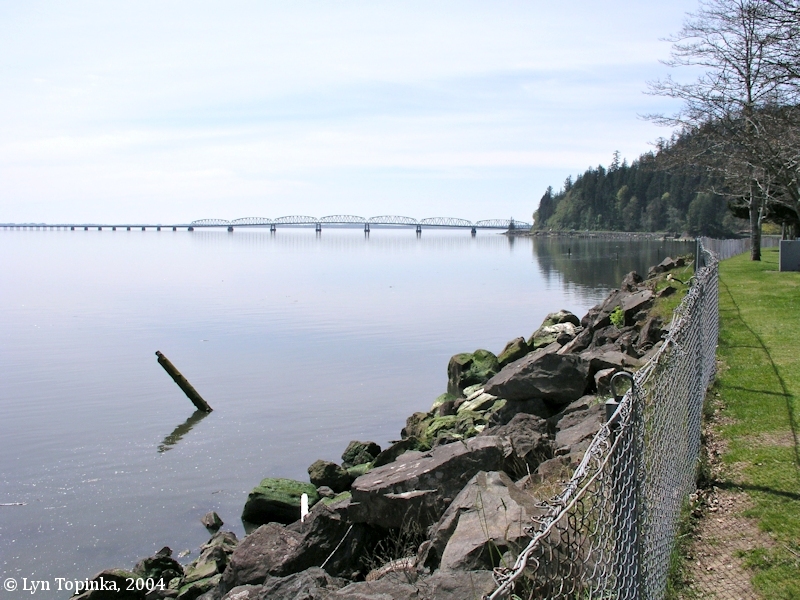 The point's Chinookan name was "Kah-eese". It also went by the Indian name "No-wehtl-kai-ilse". In 1825 David Douglas mapped the point as "Point Ellice". In 1839 Sir Edward Belcher of the British Admiralty Survey, called the point "Ellis Point". In 1841 Charles Wilkes of the U.S. Exploring Expedition used "Point Ellice". 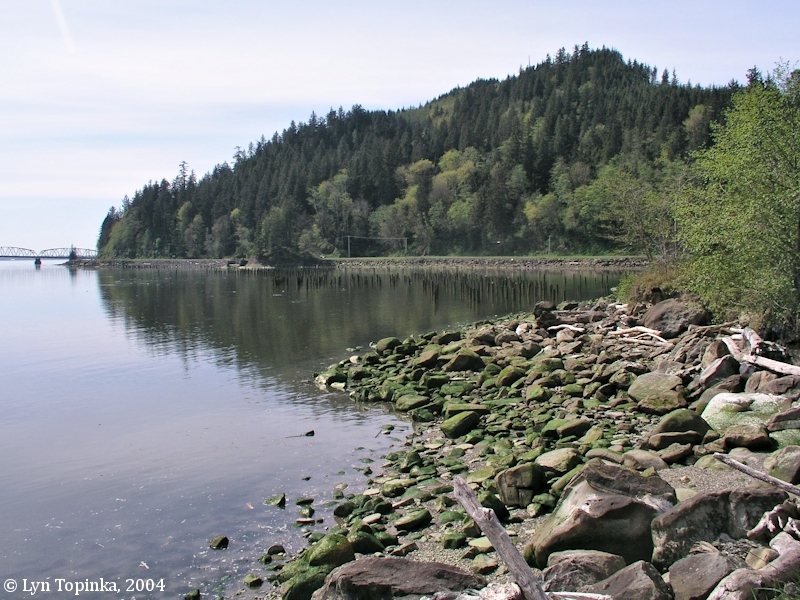 "... Point Ellice, on the northern side of the river, is two and three-quarters miles nearly east of Chinook Point; the sand beach between the two being in some places nearly a mile wide, running at the base of the hills, and surrounding a large lagoon near Chinook. From Point Adams it bears northeast, distant fourn and a third miles. Behind Point Ellice rise two hills, the southern of which is used as a range with Point Adams for denoting the entrance to the south channel, but, or course, the relative positions vary with every change of the bar. It was called Ellis Point by Belcher in 1839, and Point Ellice by the United States exploring expedition in 1841, and this spelling is found upon all recent maps, being named after Edward Ellice, then one of the directors of the Hudson Bay Company. The Indian name is No-wehtl-kai-ilse. ..."
Click image to enlarge Point Ellice, Washington. View from Megler Rest Area off of Washington Highway 401. Image taken April 9, 2004. Click image to enlarge Point Ellice, Washington, as seen from Astoria, Oregon. Point Ellice is the Washington end of the Astoria-Megler Bridge. Image taken June 16, 2004. 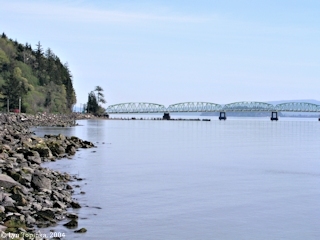 Click image to enlarge Across the Columbia River towards Point Ellice, Washington. Point Ellice is barely visible where the Astoria-Megler Bridge reaches the Washington shore. 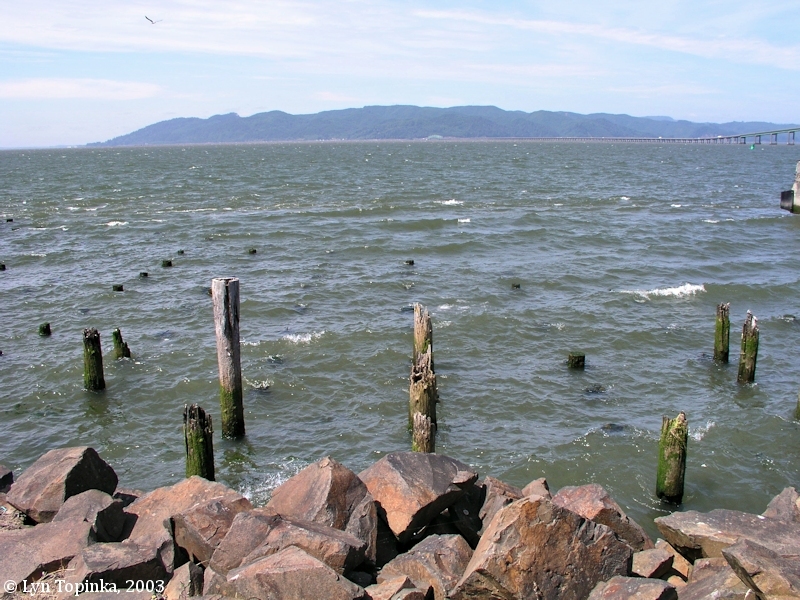 View from near Astoria Marina, Astoria, Oregon. Image taken August 2, 2003. 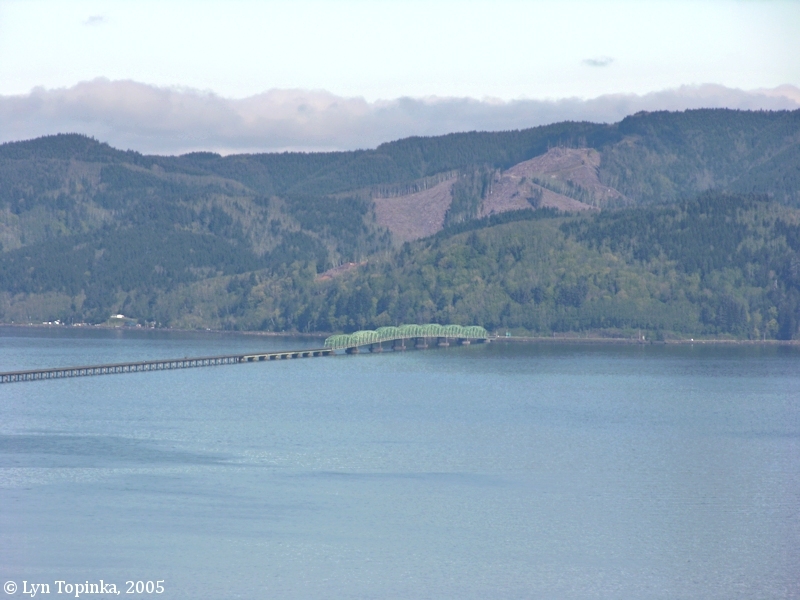 Click image to enlarge Astoria-Megler Bridge, Washington side, and Point Ellice. View from Coxcomb Hill, Astoria, Oregon. Image taken April 19, 2005. Construction on the the Astoria-Megler Bridge was begun in 1962, completed in 1966, and formally dedicated August 27, 1966. 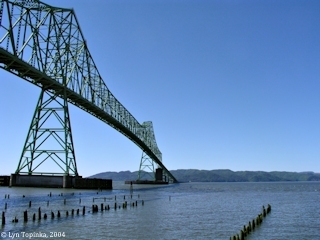 It stretches 4.1 miles (21,474 feet) from Astoria, Oregon, across the mouth of the Columbia River, to Point Ellice, Washington. 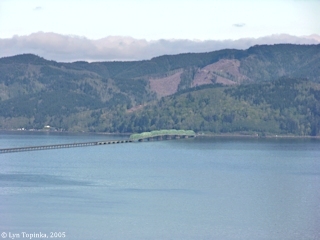 Click image to enlarge Astoria-Megler Bridge, as seen from near Station Camp. Point Ellice is to the left. Image taken April 9, 2004. 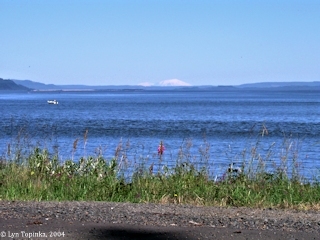 Click image to enlarge Mount Adams and Mount St. Helens, as seen from Point Ellice, Washington. View from Point Ellice just east of the Astoria-Megler Bridge on-ramp. Image taken June 16, 2004.